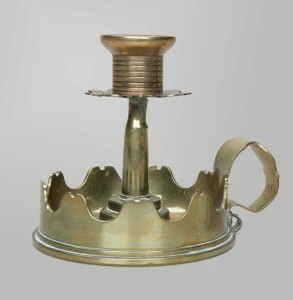 During leisure hours at the front, skilled soldiers created trench art from the remnants of war such as discarded bullets and shell casings. This “art” was not part of the official war art program. 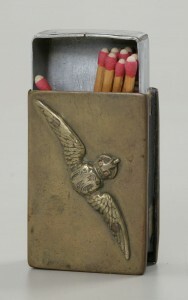 Its production was a popular pastime and many examples have survived the war. 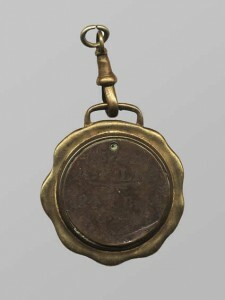 Soldiers made trench art at the front and behind the lines. Displaced civilians and Chinese labourers often augmented meager earnings by crafting and selling trench art as well. Because using government property for personal use was illegal, many trench artists did not sign their work leaving a large body of anonymous art. 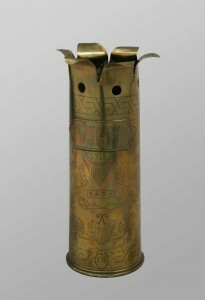 The soldiers viewed trench art as mementoes of service, and brought many pieces back to Canada after the war, where they remained in family homes for decades. The Canadian War Museum has over 100 examples of First World War artifacts, and dozens more in its collection from the Second World War and recent military operations. Corporal Frank Alexander Cameron of Barrie, Ontario was a signaller with the 2nd Canadian Division. 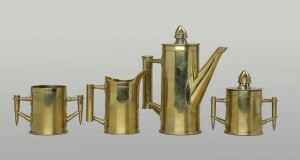 In his spare time, Cameron crafted a four-piece tea set for his mother, sending each piece home as it was completed. The materials include British 13- and 18-pounder shell cases, a French 75 millimetre case, and French rifle bullets. Cameron took four years to complete the set. He survived the war, but his younger brother, Allan Stanley, was killed in action in 1918.